There’s a classic principle in design, which is that you should go broad before you go deep. The idea is that unless you intentionally go outside the boundaries of what is known, you’ll be leaving a ton of solutions on the table, many of which could be superior to the one that’s right in front of you. The idea is that unless we explore the unknown, we’ll always end up back where we started. Going broad is essentially an undirected design exploration. We are intentionally designing outside of what is immediately realistic, and we are intentionally disregarding perceived blockers. In recent conversations with friends, it became clear that this is something many designers struggle with. Either they had a hard time looking past what they knew to be existing technical limitations of a project, or they simply felt uncomfortable looking too far ahead given any number of immediate challenges, whether they be deadlines or specific problems to solve. Having worked in the field of design for almost two decades now, I felt that I could potentially share some personal learnings, in case they might be helpful to others who struggle with “giving themselves permission” to do undirected design explorations. 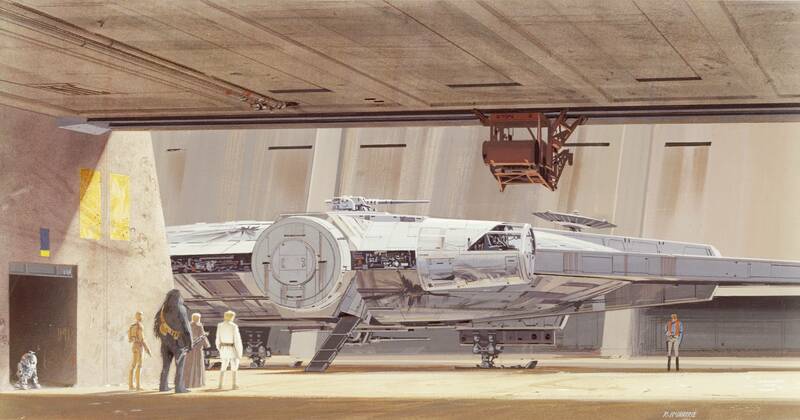 The Millennium Falcon by Ralph McQuarrie. Because I’m a Star Wars fan, you can always count on me to find a way to bring it into a Star Wars context. In this case, I’d like to steer your minds toward the tale of how Han Solo — scoundrel, smuggler, and captain of the Millenium Falcon — managed to complete the Kessel run in less than 12 parsecs. But surely you know that a parsec is a unit of distance, not time? Surely Han was just just bad at physics and was trying to impress would-be passengers to pay more? Come now. Yes, that may still be the case, it certainly would be in his character to do so. But the reason Han was able to actually complete the Kessel run in less than 12 parsecs (11.5 to be precise, citation needed), was that he took a shorter, more dangerous route to Kessel. Han succeeded because he disregarded the dangers of veering off the path, by then going outside that beaten path, and ultimately he did so by having faith that it might work. Serendipitously, this maps well to the craft of design. Let’s extract from Han’s heuristics three principles of undirected design explorations. The first step is to accept that you won’t encounter literal space dragons as you explore. The very worst thing that can happen as a result of you giving yourself permission to explore, is that you’ll end up in a dead end (or in Han’s case, a black hole). But even then, you have to trust that this dead end has intrinsic value. Something led you to take that path, and you followed it to the end. Maybe you found out it didn’t work, but now you can relax in actually knowing that. You have cauterized that idea (just like how a lightsaber cauterizes wounds as of the 1997 special editions). You can let that idea go, knowing it’s been explored to its depths, and you can proceed to explore other ideas. You won’t know whether something is possible, or whether an idea is viable, until you actually try it. If you give yourself permission to pretend anything is possible, it opens up avenues to explore that you otherwise wouldn’t have considered. Trust that there is a solution to any challenge. Imagine it being out there, shrouded in fog, and that the only way to find the path forward is by exploring in any direction. If you keep exploring long enough, eventually the fog will lift and the best path forward will present itself, clear as day. That path might not contain answers to your immediate challenge at hand, but maybe it will instead suggest where you’d like to be down the road. Consider that a vision of where you want to be, then work to create steps on a roadmap to get there. In shaping each step of the way you can get closer to that vision, and you’ll eventually end up in a nice place. On the other hand, if your process is driven only by a near-future desired outcome, you’ll only end up in a place you’ve already been. The path to Kessel is 18 parsecs, mapped in such a way as to avoid a string of deadly black holes. Suggesting it can be finished in less than 12 is a little crazy. The only way anyone would ever actually do such a crazy thing, would be to have faith that it could be done in the first place. For the craft of design, it’s okay to believe a particular approach or idea is crazy and impossible, so long as you still give yourself permission to explore it. It can be really hard to give yourself that permission, as the more you know about a task, the harder it can be to disregard boundaries you know are present. You have to have faith that giving yourself this permission will benefit you long term. You have to believe that if you don’t do this, you will block off ideas from even entering your radar. If it helps, pretend your explorations are “what if’s” — pretend they are strawman examples that you know won’t work. Allow yourself to explore them regardless, just to understand how they don’t work, or how badly they would work. As mentioned, you might end up in a dead end, but you’ll still be smarter for it. Or, you might be surprised to find a happy accident: maybe that crazy idea of yours just might work. Or maybe a variation of it could! If you’re on a deadline, it can be tempting to take the path of least resistance and skip the “go broad” step. You might feel like an undirected design exploration is a luxury you simply can’t afford. In that case, maybe try and time-box the explorations. Keep them as low fidelity as you like: use crayons! You can even keep it text-only, and write a stream of consciousness of sorts — a rapid-fire series of ideas and how they would be supposed to function. But do it regardless. If you jump immediately on the idea that seems the most actionable right now, you’re arguably wasting time in the long run. At best, you’ll end up making only slight iterative improvements. At worst, you’ll end up fortifying a fundamentally flawed approach, just making it that much harder to eventually get to a good place. Trust that the process is more important than the immediate outcome. Allow yourself to think ahead (way ahead) and consider the long-term vision. It’s always easier to pull back to reality once your exploration process is done. Divide that vision up into steps on a roadmap. Define each step as the minimum amount of work that gets you closer to the vision while still providing an iterative improvement. By being steps towards something greater, you’ll ultimately end up with something compelling. Have faith that your aimless design explorations have intrinsic value. Even when they fail, the failure is informative, and it’s a delighfully cheap way to fail if you do it at the start. Once you trust in the value of this process, it becomes easier to make the elbowroom that is necessary to cultivate new ideas. And as with all things in life, the more you do it, the easier it becomes. My family has supported UNICEF for as long as I can remember. I grew up with their gorgeous puzzles that featured all the colors and kids of the world. Over the past many years I’ve donated to various charities, but UNICEF has always been a staple that I’ve given to on a monthly basis. It’s probably been more than a decade now. Last week I cancelled my membership and today I joined instead the World Wildlife Fund. I don’t see myself coming back to UNICEF, and given the history my family has with this organization, this fact is crushing to me. The reason I quit is that a few weeks ago, UNICEF launched The Hopepage, which mines cryptocurrency using your computer power. While this might seem smart on the face of it, in a world where climate change threatens everyone (and especially those UNICEF aims to aid), spending electricity looking for imaginary coins is the last thing we need. I find it to be a collossal lapse in judgement on part of UNICEF, and I cannot fathom how this project got past the idea stage. But because it did, I can’t trust the organization anymore. It may “only” be the Australian division that started this, but the reason I supported UNICEF in the first place was exactly that it was a global organization, one that had the reach and potential to effect real change. Perhaps even worse is that by resorting to crypto mining, UNICEF is tying the practice of mining crypto-coin to a good cause. But it is not a good cause, it is an irresponsible use of power that the globe cannot afford, not now, not ever. Sure, the blockchain has potential, and proof of stake based currencies sound like they could be promising. But so long as mining crypto costs the equivalent energy usage of a medium sized country, such computer power should be spent curing cancer, doing something real. WWF fights climate change to protect nature, wildlife and the ecosystem necessary to sustain them, and incidentally us. As of now, they have my support. Back in the day, I designed Flash websites. I was pretty good at it too, and it netted me a job as a Flash animator and designer at a small Copenhagen based studio. We made really cool things, some of them are probably still around. As time went on, though, the shortcomings of Flash became painfully obvious. It was not born with any accessibility to speak of, it didn’t print well, and it wasn’t going to make the transition to mobile. Perhaps worst of all, it was hard to build complex projects in the tool. It felt like there was a ceiling to what you could achieve with Flash, and we were bumping into it all the time, without a way to significantly elevate it. As with many nascent technologies, the writing was on the wall for Flash. A fair bit before we reached the end of the road for Flash, though, I had decided to look for opportunities elsewhere. I started with Movable Type, but the difficult setup, combined with a serendipitiously timed and delightful post by Mark Pilgrim, I quickly made the move to WordPress. Version 1.2 had just been released at the time. WordPress was easy to install — the “famous 5 minute install” was not hyperbole. It was easy to hack on the themes it came bundled with; PHP was forgiving, and you could quickly get something up and running with a little copy/pasting. HTML and CSS was the same — just hit View > Source, and you could look at the skeleton of a website. Most importantly, documentation was easy to uncover. Back then most of what you’d find lived in the forums. Even so, for almost anything you wanted to do, there was a code snippet. With WordPress and PHP, there didn’t appear to be any type of website you could not build. This remains true today. It feels like we are approaching a crossroads, though. There may not be a fixed ceiling to what PHP, HTML, and CSS can achieve together in the same way as Flash had, but the returns on development feel diminishing. The emergence of mobile as the key point of interaction and consumption especially, seems like it demands interactivity and performance that is not easy to achieve through traditional means. By virtue of being open source and built on web standards, WordPress can never share the fate that Flash did. But it feels like there’s an opportunity to turn the crossroads into an inflection point. Modern web-apps, including progressive web-apps — webpages that behave as native mobile apps — depict a future where pages don’t reload for every click you make; where interactions can be fluid instead of abrupt. Notably, interactions can be fast. There is also another, much more meaningful, answer. The answer is that it’s not about me. If you’re reading this, there’s a good chance it’s probably not about you either. It’s about the next generation. It’s about kids growing up today. It’s about not only ensuring that WordPress remains a relevant tool for the kids learning to code today, but about honoring our responsibility to make sure these kids learn something really valuable. In the face of robots, AI, machine learning and automation, it seems like learn something difficult is increasingly good advice for the next generation. By sticking with the old I deeply personally feel like we are doing a disservice both to WordPress, and to the kids learning it. In fact it feels like we have a responsibility to build for our kids rather than for ourselves. By moving forward, even though it’s uncomfortable, we are being inclusive of what’s to come. Yes, it means many of us will have to learn something new, but we’ll be embracing the next generation of the web, and teaching kids how to get there. All the while, we’ll be drastically elevating what’s possible in WordPress. If we believe in this future, our job then becomes to start this process as soon as we can, write documentation and tutorials, and provide good migration paths. Seems like it’s worth it. One thing that’s always boggled me is the increasing fascination with drinking coffee out of cardboard cups. Part of my fascination stems from the fact that it seems like a huge waste of resources — you could be making virtual reality goggles from that cardboard! But most of my curiosity has to do with the indisputable fact that coffee tastes worse out of cardboard. I consider that truth to be self-evident. The delicious nectar that is coffee deserves better than to be carried in laminated paper and guzzled through a tiny hole in a plastic lid. I get it, I get it, you can take a cardboard mug with you on your commute, or as you’re walking down the street, or as you’re waiting in line, and coffee through a plastic lid is better than no coffee at all. But I’ve seen things you people wouldn’t believe. I’ve seen people in non-commute non-transit situations pick cardboard over glorious porcelain — intentionally and of their own volition and not while under duress (I checked to make sure). Usually I can even all I need to. But when it comes to coffee, and porcelain is an option, and you still choose cardboard… I’m all out of evens. At that point, I can’t even. I like the idea that if I need to go somewhere, I can take the coffee with me. Okay, that’s actually a fair point. I mean, I’d just gulp down the coffee from the porcelain and then go ahead and grab another one in cardboard to bring along, but sure, the above is a cogent argument. Still, I can’t help but feel like cardboard coffee is becoming a status symbol outside of just mobility: “Look at me, I’m on the move!” And that makes me sad. It makes me even sadder than it does when people add sugar to their coffee. This was originally posted elsewhere. It happened. My 4 year old has found a franchise to latch on to. It’s not ideal: the one thing I’m the most allergic to in the world is horses. But if she’s into ponies she’s into ponies and there’s nothing I can do about that except embrace it. She’s got the toys, she’s got the bed-blanket, she’s got the t-shirt, and her favorite pony is Rainbow Dash. It’s a thing. As an overprotective curling-dad, I consider it my solemn duty to learn about this thing that’s absorbing her attention. So I have been watching the show with her, trying to soak up the pony lore, learn of the details that make out this equestine construct. The show follows Twilight Sparkle, a purple unicorn, as she visits “Ponyville” — the shining gem of the land of Equestria. You know… from equo in latin? Horse-land? Get it? Twilight makes friends in Ponyville. Several of them. And she’s taught that though they are all different in appearance, interests, personality and even race, their friendship is the most important thing there is. When they’re all together, their friendship is literally magic. It’s in the tagline. Sounds good right? It’s perfectly fine that my daughter watches such a diverse, female-positive and all-embracing show, right? One of my favorite episodes of Lost — bear with me — is the one where wheelchair-bound John Locke cries “Don’t tell me what I can’t do!” and then goes on a walkabout. This is at the core of the values I want my daughter to learn: if she can dream it, she can do it. For that reason I already know the answer to questions she might one day pose to me: “Can I be an astronaut, dad?” YES. “Can I be at the Olympics, dad?” YES. She’ll learn eventually that it might not be a walk in the park, but there’s no reason she should have some sort of arbitrary mental block put in place by me, preventing her from even trying. Which brings me to Equestria. In Ponyville, there are three races of ponies. The ponies you know, unicorns who have magical powers, and pegasi who can fly and make it rain. They all live and work together seemingly in perfect glittering harmony. How does this even work? How aren’t the only-ponies perpetually jealous of the other two races? Ponies are literally born with predisposed skills. Unicorns have magic powers, one of them being that they can write. Pegasi can fly. Sorry Applejack, I suppose you have to manually pluck those apples for selling on the market to make ends meet. If only you were a unicorn you could just use magic, but hey, life’s tough right? Applejack is basically caste-blocked from ever advancing beyond her racially defined place in society. The fact that only unicorns can write has its own problems. History is written by those who can, well, write… right? I hope everyone trusts the unicorns to be truthful. Better not upset them. Ever noticed how My Little Ponies have back-tattoos? Applejack has apples, Pinkie Pie has balloons. Those are literal coming-of-age tattoos. Puberty isn’t mentioned, but it’s implied that once a pony reaches that age, whatever “talent” they have is stamped on their back. Forever. A visual indicator of what you are. The stamps are called cutiemarks. Back-tattoos aside (some of those are really lovely, I’m sure) I don’t know that I appreciate the idea that you even can have a talent as such—how about those 10,000 hours? What about multiple “talents”: which one gets stamped on you? And why does your one talent need to be permanently advertised to the world? What if your talent is not showering? If you’ll indulge me as I recall a history lesson about mechanical vs. organic societies, this “know your place” undercurrent that permeates Ponyville is a trait I do not find attractive. Also, if I am to ever get a back-tattoo I want it to be something I choose to get. Probably a japanese glyph I think means “fire” but in fact means “toast”. Something I can laugh at years down the line, not something that forever defines my place in the world. Another observation was that every single pony in Ponyville is either beautifully styled and coiffed at all times. Or an unsightly donkey dragging a cart with a grumpy look on their face. In fact I don’t think I’ve seen a single handsome donkey on the show. They’re like morlocks. One of the dude-ponies was called “Shining Armor”. A bit on the nose, eh, Lauren Faust? Also, why weren’t there any any girl knights? My daughter happens to love playing knights and princesses. She’s the knight, I’m the princess. I don’t know what the lesson is. I think I wanted to vet the show, but having now watched one too many episodes with my daughter on the couch, I’m not sure there’s really a lesson to learn here. Selma likes ponies, she likes watching them on the television with me. Perhaps she doesn’t have to learn about societal norms and expectations and caste systems and harmful stereotypes through a kids show about magical ponies, at age 4. She likes Rainbow Dash, and I think it’ll start and end with that. This post originally appeared on Medium, but is reposted here so I can laugh at it in 10 years. A popular brand uses this as their tagline, and it’s always annoyed me terribly. I was brought up to know that as a human I have inherent value. I try to raise my daughter the same way, so I keep reminding her how much she means to me, bolster her heart to protect her against inevitable douchebags. In that vein, everyone is worth it. This brand sells … perfume? Face cream? I can’t even recall, and I don’t even care. The point is, their tagline is pointing out that you deserve to spend your money on their product. Well what if I can’t afford the product? Does that mean I’m not worth it? We’ve been over this. The human condition is tough. Things don’t always go as planned. Some people get a particularly short end of the stick of life. There’s no justice to it, just wanton cosmic random chance. Whether you end up able to afford the face cream you’re worth is entirely up to a unique combination of the absence of bad luck, decades of hard work, and growing up in a place where such hard work pays off as it should. I don’t usually watch TV, so I’m mostly spared zapping by beautiful models parrotting off the tagline in a bubbly tenor. Thankfully, because I think I’d go insane. In a world with people who would take medicine, antibiotics or clean water over a goddamn face cream, the phrase cuts me like a knife on a blackboard. Everyone is worth it. I believe it’s in a charter somewhere. How’s that for a face cream tagline? religion, noun the belief in and worship of a superhuman controlling power, especially a personal God or gods. Clearly just by looking at the dictionary, one seems incompatible with the other. All the delicious nuance stems from the fact that the term "god" is part of both definitions. Quick intermezzo before we get into the weeds: I have many friends with a multitude of different religions, people whom I love and respect deeply. I'm not here to take anyones faith away. This is not about whether religion is a force for good or not, there are far more intelligent debates to be had elsewhere. I just like discussing semantic nuance. What makes it so difficult to pin down is the fact that atheism is really just a word in the dictionary. We're not even very protective about such words, so we change its meaning from time to time. New information comes to light! The term evolves and mutates and comes to include more meaning still. Looking broadly, though, the definition of atheism forks in two general directions. One direction has it defined mainly as a disbelief in a god or gods, while the other considers it a lack of belief in a god or gods. Did you catch the difference between the two? It's quite subtle, yet substantial. Disbelief means you believe there are no gods. You've put your two and two together, and decided hey — it just doesn't make sense to me. This is unlike religion in a couple of obvious ways, first of all the fact that there's no holy text that describes what you must or must not believe. There's no promise of an afterlife or lack thereof if you don't, err, not believe in god. There's no codex of laws you have to follow to be a "true" atheist. And there are no places you can go to to meet other atheist to, uh, not pray with. (Actually you can still say a prayer if you want to, it's not like The Atheist Police comes knocking on your door if you do). The absence of belief, on the other hand, is a bit trickier to pin down. If for whatever reason you never learned about god, well, then you are without belief in god. How could you believe in something you never heard of? Take my daughter for instance. She's 3, and she's only talked for the past year or so. I don't think anyone has told her about religion, not that I know of at least. So she is, by definition, without belief in god. Literally atheos — greek for "without god(s)". It wasn't her choice, how could she even make one? I'm not even sure she'd understand what I was talking about if I tried — she'd probably ask for her juicebox and crayons. From this perspective, being an atheist is, in many ways, a default position. It's what you're born as. Even if you later in life find solace and happiness in religion, until you found that religion you were for all intents and purposes, an atheist. There's no shame in that, it's just a word. I half expect some readers (thanks for reading 737 words discussing semantics by the way) to ask me: why so defensive, are you sure you're not describing a religion? Sure, once in a while you'll encounter someone who takes their atheism so seriously it borders on being a religious experience for them. But that's fine, they can call themselves atheists too. It's not like you get a badge at the door. Atheism isn't organized behind a hashtag, and it's not about ethics in games journalism. You are an atheist until you choose not to be, and there's room for all of us. My baby has an inner ear infection. Often times these ailments disappear on their own. Other times they get real bad. Thankfully we have Penicillin, which fixes it right up. One day in 1928 — it was a Friday — the scotsman Alexander Fleming went about his daily business at St. Mary's Hospital in London. He was working in his laboratory when he discovered he'd forgotten to close up a petri dish of bacteria from the night before. What he noticed would change the world: a mould had grown in that petridish, and in a halo around that mould the bacteria had stopped growing. What Alexander Fleming had discovered would save tens of millions of lives in the century to come: this natural mould exuded a substance that had antibiotic properties. Not a decade later we had Penicillin, and on this Friday in 2014, Penicillin is helping cure my baby girl. Thank you, Alexander Fleming. There's a problem, though. Penicillin is a wonderful drug, but bacteria — just like humans — evolve and grow stronger. Put a drop of Penicillin in a petridish of bacteria and the bacteria will die. Probably. There's a tiny chance some of those bacteria will survive due to a random Penicillin-resistant mutation. Those lucky few survivers might reproduce and migrate. Repeat this process for a century and you're bound to have a couple of strains of bacteria to which even the strongest of Penicillins are useless. We knew this would happen. Yet still to this day, Penicillin is used on a grand scale in meat-production of all things. When cattle have particularly bad living conditions, when too many cows are huddled up in too little space, they'll inflict little scratches on each other, wounds that might heal naturally on a green field of grass. But if your living quarters are also where you go to the toilet, no such luck. Hey, thought the meat industry, we can just pump the cattle full of Penicillin and no bacteria will grow in those wounds! The way we treat our cattle is troublesome enough, but the inevitable consequences should be alarming. Those dirty farms and cattle transports are evolutionary crucibles for resistant bacteria. The strong bacteria will survive and require stronger Penicillins. It's an evolutionary arms race and we're losing. We always knew bacteria would evolve to be Penicillin-resistant eventually, but if we'd been smart about our Penicillin usage, we might've had enough time to research functional alternatives. As it stands, I'm worried about a future dad and his daughter battling an infection maybe just ten years from now. I hope she'll be alright, man. So I guess here's another reason you should eat organic meat. Or no meat, that works too. Why are you revving your engine? On my way home from work today, I stopped my bicycle at a red light. There was a scooter right next to me, also awaiting the green light. I noticed the chauffeur (is that the right word? I don't think so) had his right hand on the speeder. Revving. Wroom. Wroom. Wroom. Wroom. Wroom. On and on, like a nervous tick. Surely the scooter is recent enough that he doesn't need to rev his engine to keep it from going out, I thought to myself. It wasn't a particularly cool scooter — it was the type of scooter that'll make most casual observers think "man what a lazy person, why aren't you on your bike instead?" It's fine. It was in the middle of downtown. I had a podcast in my ear, and cars were going by. The noise level was measured in enough decibels that I wasn't worried about falling asleep at the wheel; a little noise from a constantly revved engine like that will surely blend into white noise, I thought. And it should have, but this pointless revving reminded of a motorcyclist who lives in the building across from me (fortunately not for long). I'm pretty sure he suffers from a severe case of douchebag-itis, enough that he should at least have it checked by a doctor (if you don't treat douchebag-itis early, you might end up buying a Porsche Cayenne!). Now this motorcyclist constantly revs the engine, to a point where I'm pretty sure it affects the performance of his driving — it's really quite ridiculous. Alas, this happens even when there are sleeping babies around. Of which I have one. That is, she's sleeping some of the time. She's not when he's revving his engine. The difference between a motorcycle and a scooter is that one of them makes an engine-noise that could theoretically be satisfying to the part of the population that has octane in their blood. Theoretically. When I muster all the testosterone that I can, testosterone that's usually busy making me an exoskeleton for my daughter, I can sort of understand this. I can't understand revving the engine on a scooter. Because scooters are not, and do not sound, cool. Ever. If you looked up cool in the dictionary, you'd see a picture of Miles Davis. Not a scooter. Not Miles Davis on a scooter. There would be no scooters nearby. No presentations discussing the birth of the cool would mention scooters. So please dear scooterist, answer me this: why are you revving your engine? Trust me. I looked long and hard for a "my other mode of transportation is a Millennium Falcon" bumper sticker on the scooter. Because yeah, revving the Millennium Falcon, that's cool bra', yo dawg). Unfortunately, such a sticker was nowhere to be found. I could only see an itsy bitsy engine, making loud noises by the rhythmic revving. I meant to chuckle, but I was baffled chuckleless.